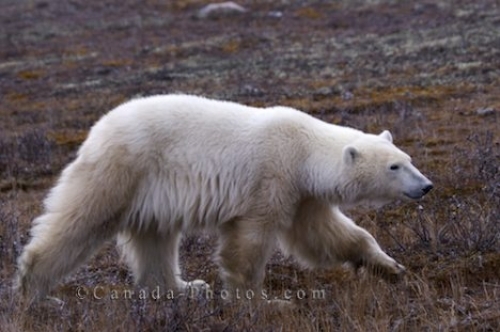 A Polar Bear running across the tundra in the Churchill Wildlife Management Area in Churchill, Manitoba as he looks for somewhere to go until the Hudson Bay freezes over. Even though this polar bear has not eaten much over the last few months, you can still see how powerful he is as his large paws stomp over the landscape. Picture of a Polar Bear running across the barren tundra landscape in the Churchill Wildlife Management Area in Manitoba.